Plain or fancy, crosses are a popular motif on shirts and other clothing today. Now you can create your own with our filigree cross stencil. Paint the background color, then cover my stencil with another purchased, decorative stencil and spray a second color over it. Apply a few rhinestones and you have a designer look tee. My 8 X 10 purchased, decorative stencil has a lattice work and leaf theme. You'll find out where to buy it at the bottom of the page. Also consider using a piece of lace or a paper doily as a decorative stencil. I used an airbrush to apply the paint but you can do it with with fabric paint and brush or sponge. Step 2 - Download and print out the stencil on card stock or copy to blank stencil sheets. step 3 - With a craft knife, cut out the grey areas. Spray the back of the stencil with adhesive stencil spray. step 4 - Place the stencil on the shirt pressing down the cut edges and aligning the middle of the stencil with the center of your shirt. step 5 - Spray the open area with Blue Suede Shoes paint. I found the color a little too intense so I sprayed again with a light coating of Silver Lining Paint which softened the boldness. step 6 - When dry, apply purchased stencil so that intersecting lines on the stencil align with the center of the cross. Spray with Black Tie paint. Remove the stencil when dry. step 7 - Wait 24 hours before attaching hot fix rhinestones with an iron or rhinestone setting tool. Place the stones by following some of the leaf patterns created with the Black Tie paint. 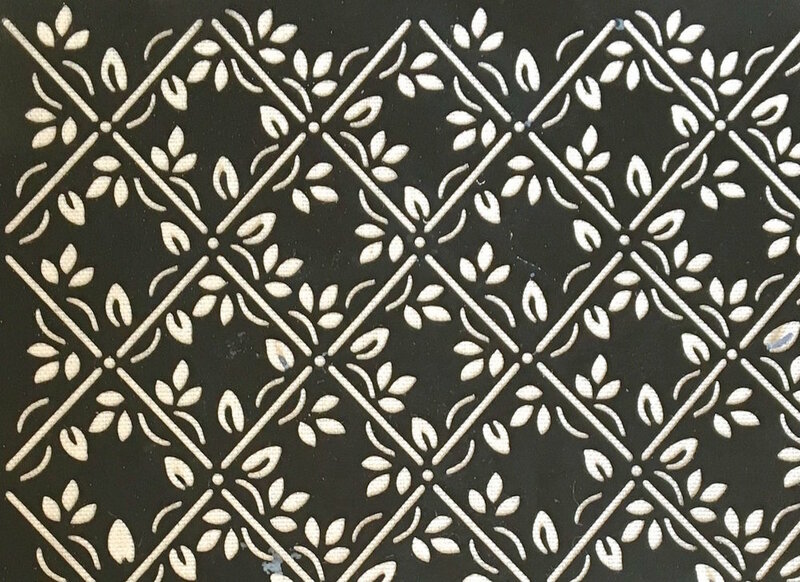 The purchased decorative stencil has a lattice and leaf theme. It's made by Plaid.